The Aztec Hummingbird god, originally named Huitzilopochtli, was a major Aztec deity. He was held in particular esteem at the capital of the Aztec Empire, the city of Tenochtitlan. In Aztec mythology, he is associated with warfare and human sacrifice. Most human sacrifices were specifically meant for him because Aztecs believed that if Huitzilopochtli was defeated, the Aztecs would also suffer defeat. Sacrifices were a means to strengthen the god’s powers. The name Huitzilopochtli variously means “Hummingbird South” or “Southern Hummingbird”. The hummingbird god Huitzilopochtli had been the patron deity of the Mexica people for a very long time. In the early periods, Huitzilopochtli didn’t enjoy a paramount position in the pantheon of the Nahua-speaking people. But as the Aztecs rose to prominence and founded the grand city of Tenochtitlan, they also raised the mythological esteem of Huitzilopochtli. In the city of Tenochtitlan, he became the patron deity and Aztecs placed him in the astral world next to major deities such as Quetzalcoatl and Tlaloc. It was to him that the Aztecs offered human sacrifices, believing him to be busy in a battle with darkness. The sacrifices, Aztecs believed, helped him ward off the darkness. A number of Aztec legends relate the origins of the hummingbird god Huitzilopochtli. One of these legends claim that Huitzilopochtli was one of the four sons of the creator couple. 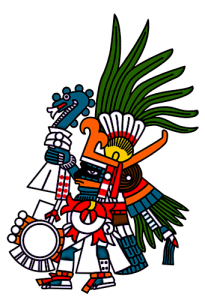 Among his siblings was the most important Aztec deity Quetzalcoatl. The myth states that Huitzilopochtli and Quetzalcoatl were asked by the creator couple, their parents, to bring Earth to order. So they creator the earliest human beings, and fire and a Sun for the world. In another story, Huitzilopochtli’s mother became pregnant with him by a ball of feathers on the hill called Serpent Hill. She already had given birth to 400 other children and a female deity. These children decided to kill her because her pregnancy angered them. But instead, Huitzilopochtli burst from his mother’s womb and killed his sister and defeated the other siblings. Huitzilopochtli was closely associated with warfare and the warriors in the city of Tenochtitlan. Aztecs believed that when brave warriors died, they flew to Huitzilopochtli in the form of a hummingbird. According to them, the hummingbird god was so bright that no one could see him directly. Rather, warriors had to see at him through the arrow slits in their shields in order to behold his glory. 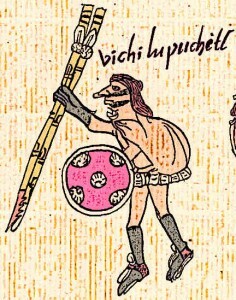 In one Aztec myth, Huitzilopochtli is depicted as being pitted against a large army whom he defeats in the end. This, researchers claim, is a parallel with the cosmic battle that Aztecs believed was fought against the stars and the moon. The hummingbird god Huitzilopochtli was closely allied with the history of the Mexica people, more commonly called Aztecs. According to Aztec legends, the Mexica people first used to live under rulers in a different region. Then Huitzilopochtli asked them to move to another place and stop calling themselves Aztec. On this journey to a new land, Huitzilopochtli guided them. At one point, his sister became the tyrant over the Mexica people, so Huitzilopochtli deceived her and guided the Aztecs away to a distant land. His sister birthed a child to fight Huitzilopochtli but the latter defeated this child and threw his heart in Lake Texcoco. According to Aztec mythology, it was at this point in Lake Texcoco that the city of Tenochtitlan was founded. Huitzilopochtli was represented in different forms in the Aztec culture. He was most commonly depicted as a hummingbird, or he was represented as a figure with features of a hummingbird adorning it. In some cases, he was shown as a figure with a black face, holding a scepter which was shaped like a snake and a mirror. His face was painted with yellow and blue stripes. In many depictions, he was seen wearing a blue-green hummingbird helmet. This last feature was particularly common in artistic depictions of Huitzilopochtli. Hummingbird god Huitzilopochtli enjoyed a central position at Templo Mayor in Tenochtitlan city. At the top of this huge pyramid-temple were two shrines. One of them was dedicated to Huitzilopochtli. Two serpent-heads were situated at the bottom of the stairway. This symbolism signified Huitzilopochtli’s battle with his sister on the Serpent Mountain, where he defeated and dismembered her. This legend may be one of the reasons Aztecs placed decapitated skulls of young women near Huitzilopochtli’s temple. 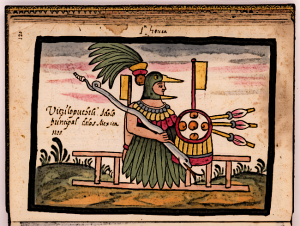 One version of the legend related to the hummingbird god Huitzilopochtli compared him to the Sun in the sky. In this version, the stars and the moon were his siblings who were also his rivals. The Sun, Aztecs believed, always chased the moon and the stars and defeated them, just like he defeated his siblings in the other version of the legend associated with Huitzilopochtli. The Hummingbird god, properly named Huitzilopochtli, was one of the major deities of the Nahua-speaking people. When one of these Nahua peoples, namely the Aztecs, ascended to power and prominence in the city of Tenochtitlan, they raised Huitzilopochtli into the highest echelon of the solar deities, putting him next to Quetzalcoatl. He was hailed as the patron deity of the Aztec city and was closely associated with warfare. This may have been a result of the legend associated with Huitzilopochtli. Many different versions of these legends existed. What was common in all of them was that Huitzilopochtli waged war against his siblings, specifically a sister who wanted to destroy him. He was able to defeat and kill her. Legends also have it that he led the Aztecs to the site of the Tenochtitlan city and it was because of him that the Aztecs rose to power and prominence. Aztecs offered human sacrifices to Huitzilopochtli in order to please him. They believed that Huitzilopochtli, as Sun, waged war against moon and the stars in the sky, and was always in need of human sacrifices in order to sustain his strength. They also believed that if Huitzilopochtli lost, the world would end in darkness.